This Polycarbonate Gazebo 2.5x2.5m in Bronze from Glendale Leisure is designed to be a permanent fixture in the garden. Finished in all weather Aluminium with a Polycarbonate roof and heavy duty UV stabilised Polyester curtains with separate fly nets. 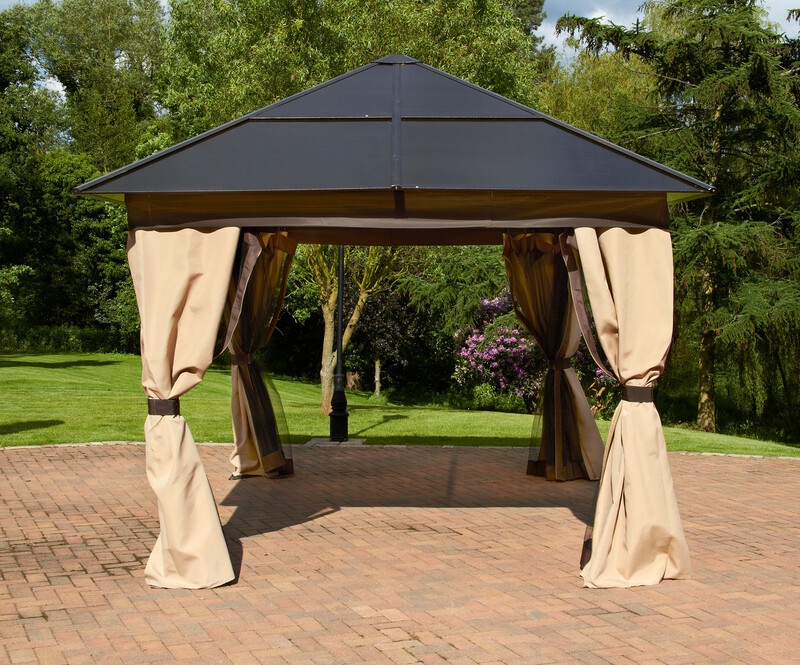 This gazebo sunshade is a well constructed and very robust aluminium structure which can be left outside all year round. The canopy and curtains can be removed when not is use during the winter months. Also available in sizes 3x3M and 3x4M. This Glendale Polycarbonate Gazebo is best constructed with 2 persons and by following the assembly instructions provided. To view our brief assembly video Please Click Here. Click the button below to add the Glendale Polycarbonate Metal Gazebo 2.5 x 2.5M Bronze to your wish list.